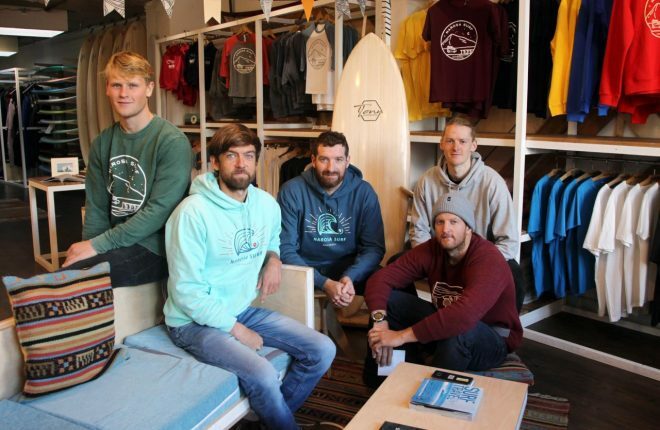 A Donegal surf school is embracing the drive to eradicate plastic by becoming one of the first outlets in the world to stock wooden boards. 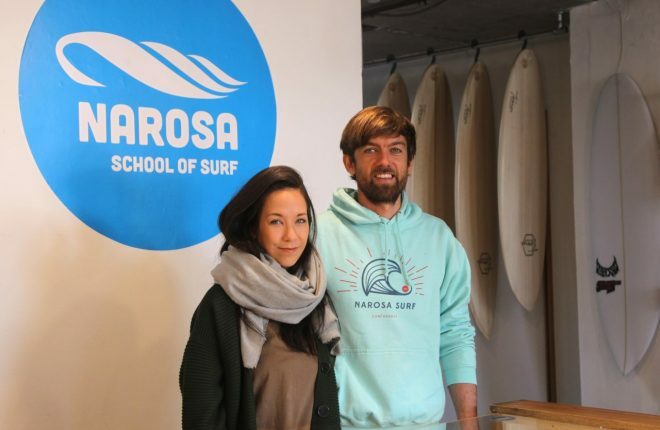 For a decade now NaRosa Surf School, based in Dunfanaghy, has been drawing ocean-lovers from across the globe to Donegal’s coast. And in many ways it has been the lightning rod for the economic upturn the town has enjoyed in recent times. All summer surfers have been flocking to NaRosa to avail of the expertise of co-founders Lee Wood, Duncan Halliday and their team. From Bloody Foreland up to Fanad, the waters – and by extension the restaurants, shops and pubs – have rarely been empty with young professionals, kids camps and groups from as far away as Russia all looking to ride the waves. Team NaRosa: Jack Richards, Lee Wood, Philippe Hetier, Oscar Manville-Hales and Duncan Halliday. Not content with being one of the coolest businesses on the planet in the county officially recognised as the coolest place on the planet though, NaRosa is now taking an ethical stance as well. 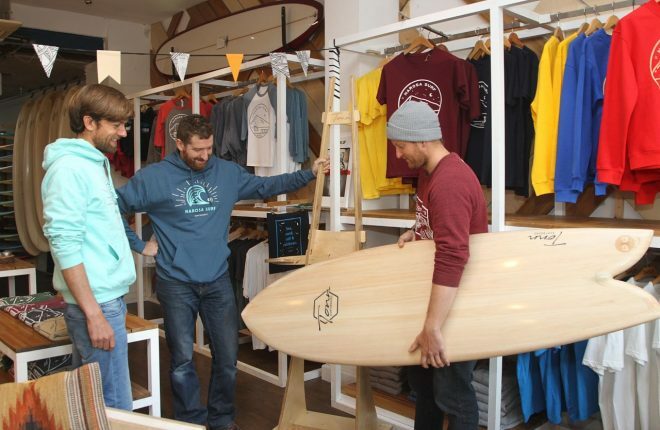 At the weekend enthusiasts gathered in the surf school, located in what used to a bank on Dunfanaghy’s main street, for the launch of one of the world’s first wooden surf boards. The product is the brainchild of furniture manufacturer Philippe Hetier. Born near the French Alps but based in Clonmel, Philippe is regarded as one of the finest woodcrafters in Ireland. A keen surfer himself, he spent years developing a wooden board to compete with the traditional polyurethane boards used the world over. And with the spotlight focused more today than ever on the amount of plastic we use and the plastic ending up in our oceans, it looks like Philippe and the team at NaRosa could just have hit on their hands. What Philippe has come up with is a board from made from 97 per-cent natural product and that is as light if not lighter, more durable and more aesthetically pleasing than most models on the market. From an environmental point of view, Philippe believes his creation could make a “big difference”. The master craftsman explained, “The trigger was splitting two boards in half in a single day. It was not very cost effective so seven or eight years ago I started looking at different techniques until we got to where we are today. That was one aspect of it. “The second aspect is environmental. Today everyone is complaining about plastic and as surfers we would be closer to nature than most people. But the industry does not provide a product that is close to nature. Lee Wood with his wife, Jude. “The last aspect was about creating a preference for a wooden board. We are there to have fun and if you are getting more out of one than the other already, then you are going to back to that one. That was the most difficult part, developing the technology and the same weight as a foam board. Wooden surf boards are not a new idea. Since the 1990s builders have been toying with the concept but none, until now, have been deemed a serious alternative to the big players like Rip Curl, Firewire and JS. “Traditionally wooden boards would have been heavy and a bit gimmicky. These perform like a normal board,” said NaRosa’s Lee Wood. Anyone looking to invest in one of Philippe Hetier’s boards should be prepared to pay that bit extra. The cost though should be off-set by longevity. “If you are surfing at a high level you would want to be turning over your board at six months. The pro-tour guys will get through 50-100 boards in a year. Take care of one of these and there is no reason it couldn’t last you ten years,” added Lee. Convincing people that the added cost is money well spent will be a hurdle, Philippe admits, but not an insurmountable one. Wooden surf boards are another string to the bow of a small company already making a big difference. NaRosa started almost by accident, both Lee and Duncan moving to Dunfanaghy more for the love of the location and its rugged, perfect-for-surfing beaches rather than with any plans for a business. “We nearly started this off the coast of Scotland but on a whim we came here. Really we just packed our bags and it all started from there,” reveals Lee. As recently as late September NaRosa was welcoming tourists through the door and the diary remains busy over the winter months. “At the end of September we had a group of Russians here surfing. Legitimately you could take a crowd of people to Moscow and they could drink, eat and party 24 hours per day, seven days a week. Lee, Philippe and Duncan with one of the wooden boards which are now on sale at NaRosa. 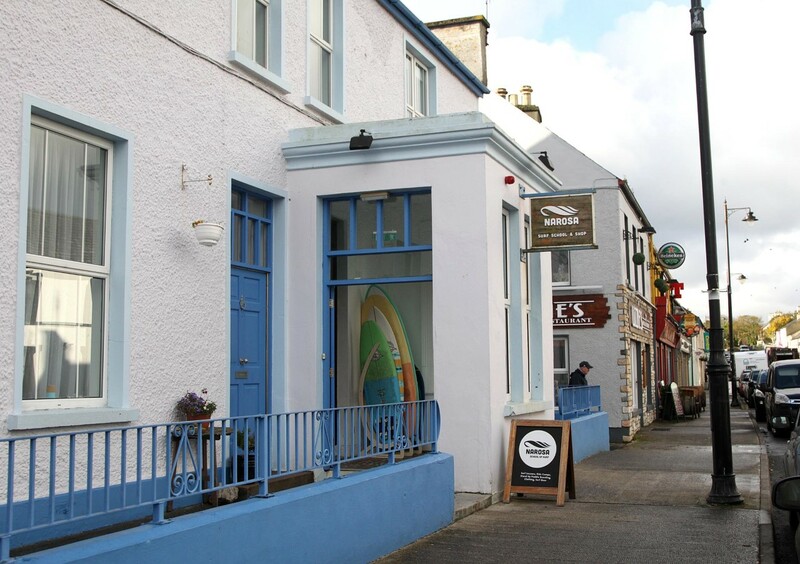 Coffee shops, yoga classes, craft stores have all popped up in the buildings around NaRosa and today Dunfanaghy is one of the busiest little towns in the county. And the team is firmly focused on keeping the positive wave they have made created going well into the future. “They haven’t found a way to charge us for using the ocean and they haven’t brought in a fresh air tax yet,” laughs Lee.